Having a hard time finding that Right Gift / Present for that Atari person? 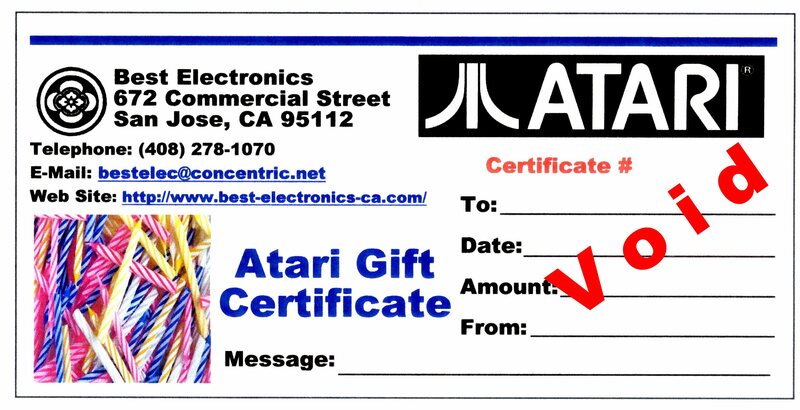 A Best Electronics Atari Gift Certificate maybe your perfect Answer. Available in increments starting at $25 and up. Best Electronics has over 5,000+ Atari items in stock. Just a Simple E-Mail and Phone Call to Best Electronics and you can print out a Best Atari Gift Certificate on your own printer. You have your choice of delivery. Best can attach a completed Adobe Acrobat PDF Best Gift Certificate file to an E-Mail to you and you can print out the Gift Certificate on your own Color printer and fill in the necessary Information. Also Best Can send (Via E-Mail) an attached PDF Gift Certificate file direct to the recipient or Best can US Mail (US/Domestic only) completed Best Electronics Gift Certificate direct to the recipient. 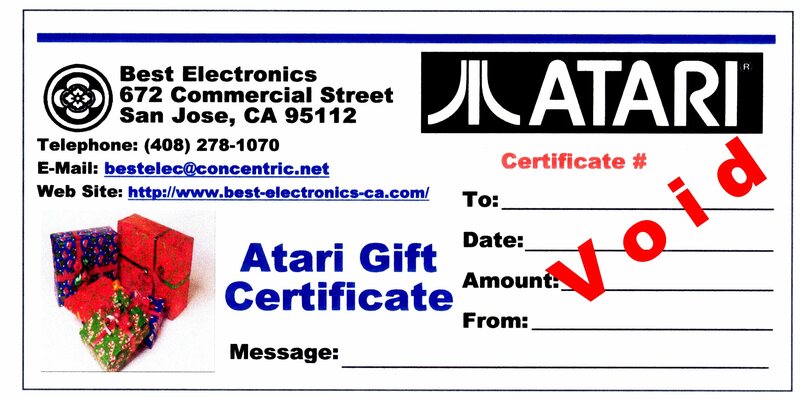 Best Electronics Atari Gift Certificates can be issued the same day or next working day after the order is placed. What is required to order a Best Electronics Atari Gift Certificate. 3. Recipients E-Mail, if you want us to E-Mail the Atari Gift Certificate direct to Recipient. 5. Amount of the Atari Gift Certificate. 6. Name and Style number of the Best Atari Gift Certificate (see the different Styles below) requested. 6. Any extra messages to be printed on the Certificate. Getting started on ordering a Best Atari Gift Certificate. _ Here if you would like Best Issue a fully filled out (Printable) Atari Gift Certificate attached as a PDF file in an E-Mail to Purchaser. 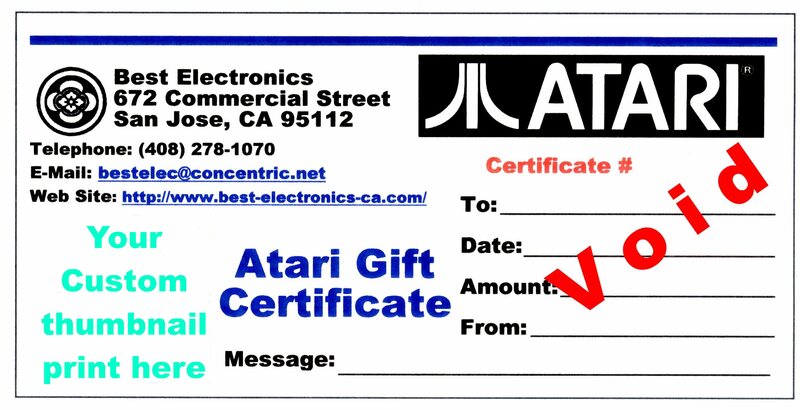 _ Here if you would like a Blank Best Atari Gift Certificate issued with the Best Certificate number that you will fill out yourself (Purchaser), attached as a PDF file in an E-Mail to the Purchaser. _ Here if you would like Best Issue a fully filled out Atari Gift Certificate attached as a PDF file in an E-Mail to Recipient. _ Here if you want Best Electronics to US Mail a fully printed out Atari Gift Certificate direct to the Recipients Mail to address. These scanned thumb nail samples of Best Gift Certificates shown for your reference. Your printed out Check Style Best Gift Certificate will be about double size of the thumb nail samples, higher quality (if printed at 1440 DPI) and will not have a black reference border around the Gift Certificate. We can also do a Custom Atari Gift Certificate with your own Thumb Nail JPEG picture you provide / E-Mail us (in the bottom left corner) No extra charge. Examples: your pet's picture, Wife, Children, Mother, Father, Sister, Brother, Grandmother, Vacation picture and so on. 1. 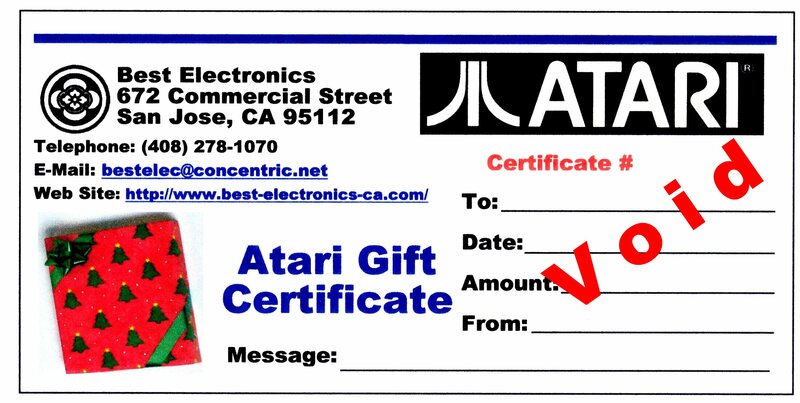 Best Atari Gift Certificates are good for Atari purchases from Best Electronics only. 2. Issued Best Gift Certificates can not be used to purchase other Best Electronics Gift Certificates. 3. 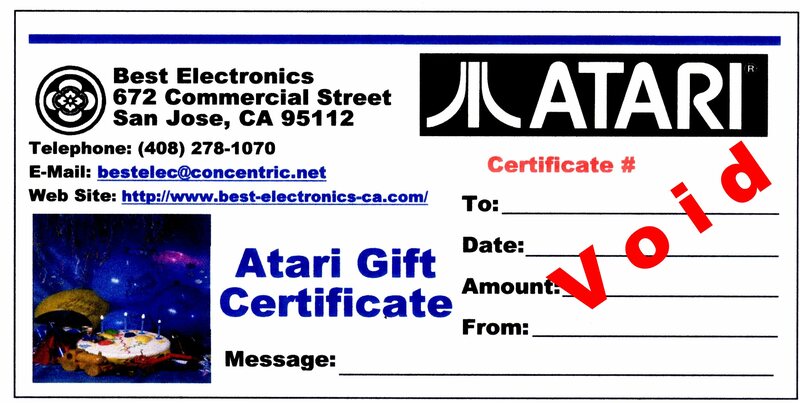 Purchase amounts that exceed the total / remaining value of the issued Best Atari Gift Certificate require a Credit Card or Check for the balance due. 4. Issued Best Atari Gift Certificates may not be redeemed for Cash and cannot be returned for a cash refund. 5. 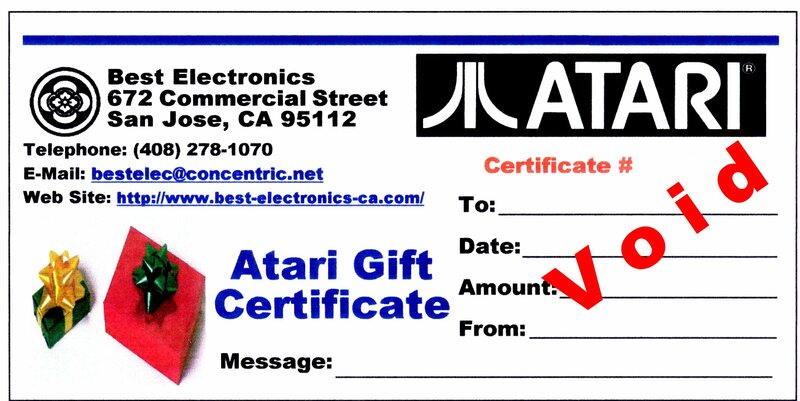 Issued Best Atari Gift Certificates and unused portions of Best Electronics Atari Gift Certificates must be spent / used within two years from the date of purchase of the Gift Certificate. 6. Any unused balance of the issued Best Atari Gift Certificate will be placed into the recipients Best Electronics Atari account, which must be used by the recipient within the two year limit of issue and is not transferable. 7. Atari orders placed using a valid Best Atari Gift Certificate can only be shipped to the Recipients original ship to address given when the Gift Certificate was originally purchased or to the original Purchaser's Credit Card Bill to address or PayPal verified ship to address. 8. We reserve the right to close a Recipients gift Certificate account and request alternative forms of payment if a fraudulently obtained Best Atari Gift Certificate(s) is redeemed by anybody else other than the original Recipient. 9. 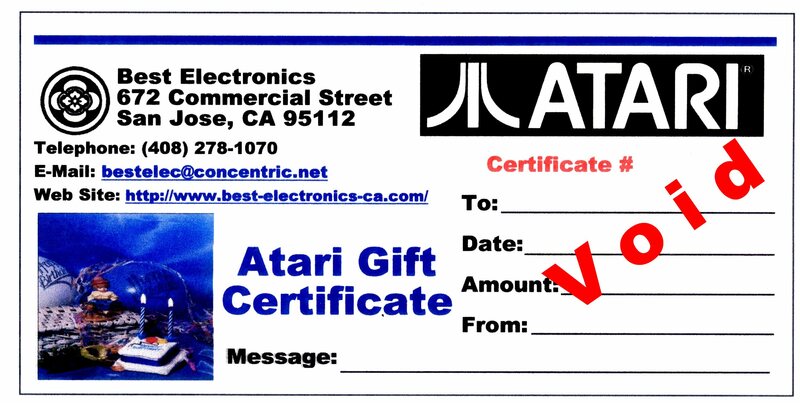 Best Atari Gift Certificates are Void, without a Best issued and Best Preprinted Gift Certificate number. 10. 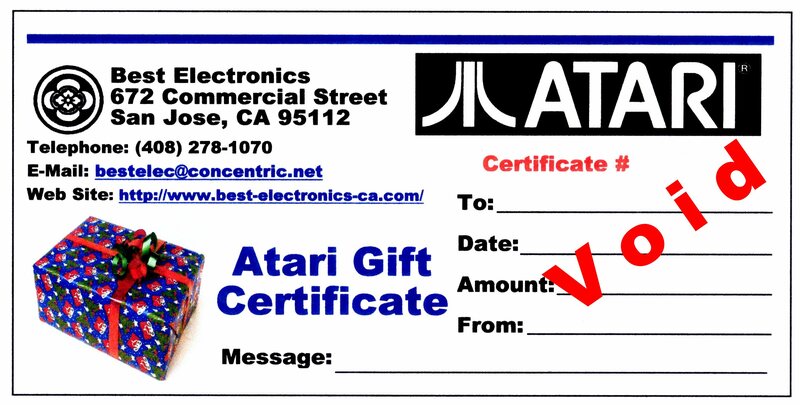 We are not responsible for lost or stolen Best Electronics Atari Gift Certificates. 1. Contact Best Electronics Via E-Mail or Phone. 2. Give Best Electronics your Atari Gift Certificate number. 3. Give us a list of Atari Items you want. If you do not have Adobe Acrobat PDF Reader program installed, click on the button below to download a free copy of this Internet standard must have program.